The LilyAna Naturals cream aims to succeed in resisting wrinkles and fine lines by utilizing various anti-oxidant ingredients. Anti-oxidants help to keep free radicals away from damaging your skin. Anti-oxidants are the best way to fight the damaging effects of aging, discoloration, and sun damage. The vegan and animal cruelty free ingredients in the cream are also capable of improving skin discoloration along with fighting wrinkles. The ingredients that help to heal and repair the skin include the likes of the skin helpful vitamin C and E. Other natural and gentle ingredients within the product include aloe vera, orange extract, rose, and other various oils and anti-oxidant ingredients. No harmful or artificial chemicals are permitted to hamper the anti-aging benefits in this moisturizer. Avoiding parabens, harmful chemicals, and artificial chemicals helps to keep the focus of the beauty product on healing the skin rather than just using skin harming filler ingredients. According to the Washington Post article “Are parabens and phthalates harmful in makeup and lotions?”, parabens are viewed as potentially damaging to hormone systems in the body. It makes sense why paraben free would result in positive anti-aging benefits, as a paraben free product won’t disrupt your body’s healthy hormone levels. The bottle that this moisturizer comes in is sold in size 1.7 ounces. It’s packaging has been improved and now comes in a pump bottle. I find the bottle with a wide pump very quick and easy to use rather than having to scoop your fingers into a jar. 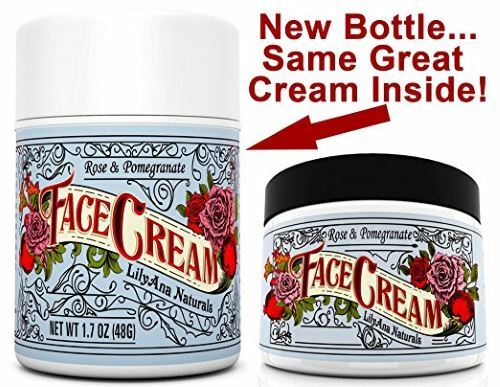 It is sold for a reasonable price and is far more affordable than some other anti-aging moisturizer products. It is a simple white color with a colorful label. 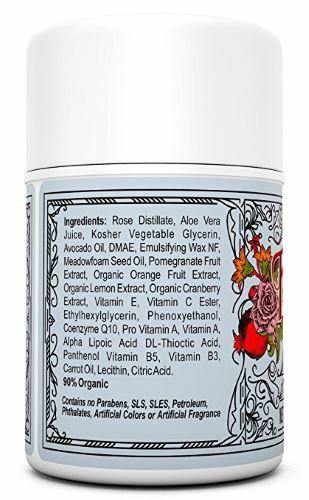 The label has colorful images of roses and pomegranates, which are the two primary all natural aromas within the face cream. 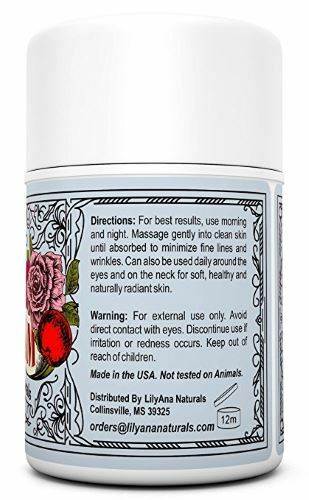 The LilyAna Naturals products are all made in the United States. The beauty brand’s anti-aging moisturizer is no exception. American citizen beauty consumers who prefer to buy products from their home country will likely appreciate this product. The main pro of the LilyAna Naturals face cream is foremost that it is anti-aging. The benefits include: reduction of fine lines, wrinkles, dryness, and skin discoloration. The product does this effectively by use of gentle premium ingredients. This moisturizer is effective in fighting aging because it does not use harmful chemicals. The product does not contain any parabens, artificial scents, and artificial colors. This makes the product that much stronger and more impactful at improving skin’s complexion. Based on customer reviews, the cons of this product consists of the bottle being somewhat small and the scent isn’t for everyone. The bottle is only 1.7 ounces. It is a fairly inexpensive product, so it is reasonable to purchase a few bottles at a time if you go through product quickly. The scent is a combination of rose and pomegranate. Many customers love the scent. A few have said that the smell is not for them though. If you know that you are allergic or dislike rose and pomegranate, then this product is not for you. The LilyAna Naturals moisturizer is for you if you need a gentle, nourishing choice for your skin care routine. The anti-oxidant rich product will give you the skin revitalizing you need. The rose and pomegranate scent will keep you feeling refreshed and ready for your day. If these are some of the qualities you are looking for in a face cream then you might want to give the LilyAna Naturals moisturizer a chance to improve your anti-aging game. Not quite your thing? Click here if you want to find out about other natural face moisturizers.